We are a giant Manufacturer, Supplier, and Exporter of Vegetable Cutter. Our entity is based in Gujarat, India. We manufacture it in accordance with the latest industrial standards and norms. 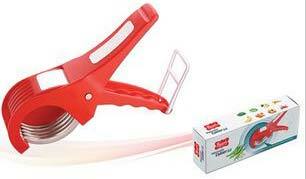 It has sharp blades, which ensures a smooth cutting of various vegetable. We use the superior quality raw materials and updated techniques for manufacturing our Vegetable Cutter. We offer it to various hotels, restaurants, and kitchenware dealers, at a highly reasonable price.